Naan bread gets topped with basil pesto, chicken and cherry tomatoes in this quick baked entrée. 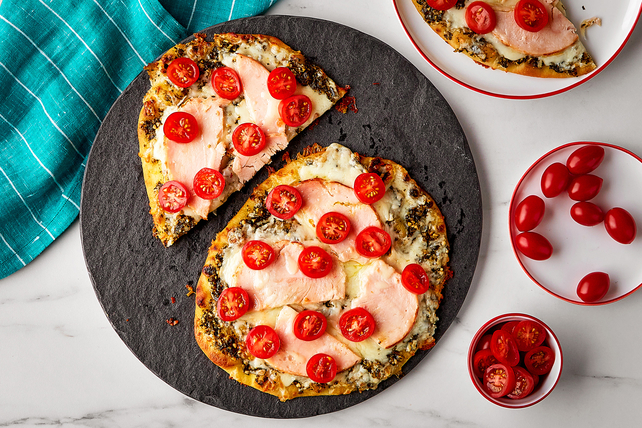 Our take on pizza is ready in less than 30 minutes and uses just a handful of ingredients. Place breads in single layer on baking sheet; spread with pesto. Top with cheese and chicken. Bake 10 to 12 min. or until edges of breads are golden brown. Top with tomatoes. Cut each naan bread in half to serve. Naan is an Indian flatbread baked at a high heat in a tandoor oven which results in its signature bubbly texture and smoky flavour.